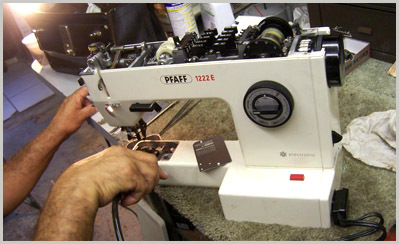 Top Reasons to have Poway Sewing Repair Your Sewing Machine! Here’s some quick troubleshooting operating guidelines. – Make sure the plug is properly connected into wall outlet. – Check to insure that the clutch release knob is tightened after winding bobbin. – Check upper threading making sure the thread is fed through the tension thread dial. – Check lower threading making sure thread is snapped into the tension spring. – Always make sure presser foot is lowered before starting to sew. – Be certain that stitch length is set according to the stitch you selected. – Insure that needle is not bent. – Needle clamp screw may be loose. If this is the case, the upper and lower thread will not form a lock stitch. – Always make certain the presser foot is the correct one for the stitch being sewn. – The flat side of the needle should face toward the back of the machine. – Machine may not be threaded correctly. Guide fabric gently through machine: pulling excessively will cause the needle to bend and then break. – Tension on upper thread or lower thread may be set incorrectly. Insure tensions are not set too loose. – Tension on upper thread or lower thread may be set incorrectly. Insure tensions are not set too tight. – If the bobbin case is not properly set into the shuttle, the thread will jam. Check to make sure the bobbin case is inserted tightly and cannot move from side to side. – Again, use the correct needle size in combination with the fabric. – Make sure the bobbin winder shaft is pushed to right. – Make sure the clutch release knob is loosened. – Check to make certain that the buttonhole foot is attached. – Carefully follow the instructions in your owner’s manual. Every machine functions differently for making a buttonhole.